She said this is further proof the NDP and the Tories don’t want her in the debates. OTTAWA — Green party Leader Elizabeth May is blasting NDP Leader Thomas Mulcair for failing to keep his word and participate in the English-language television leaders’ debate. Speaking to The Huffington Post Canada on Tuesday, May said the only way Conservative Leader Stephen Harper can avoid showing up for the traditional televised leaders’ debate in October is if Mulcair allows him. The NDP announced late Tuesday that their leader will participate in a French-language Radio-Canada debate with Harper, May, Liberal Leader Justin Trudeau and Bloc Québécois Leader Gilles Duceppe on Sept. 24. Mulcair will also attend a bilingual Munk debate on foreign affairs on Sept. 28 with Harper and Trudeau, to which May and Duceppe are not invited. Mulcair had previously agreed to a debate with Harper and Trudeau hosted by The Globe and Mail, and another with Harper, Trudeau and Duceppe hosted by TVA, a private French-language station. But it was what the NDP didn’t announce that had May upset. His staff confirmed that Mulcair is pulling out of a previous commitment to participate in the English-language debate hosted by CBC, CTV and Global television stations— threatening cancellation of the entire debate. The English televised leaders’ debate, which reached more than 10 million Canadians in 2011, has been a fixture of federal elections since 1968. This spring, Harper announced his intention not to participate in the TV network debates. Tory sources suggested they didn’t like the terms being proposed by the broadcasters, but spokesman Kory Teneycke insisted the Conservative leader just wanted to have more debates with different outlets. The surest way to ensure that Harper would appear, May said, was for the opposition parties to follow through with a commitment they had made this spring to show up anyway and leave a spot on the podium empty for Harper. Harper, she said, is preventing Canadians from having access to a fair, neutral debate that includes all national party leaders and could be seen by the most people. Wednesday, NDP spokesperson George Soule said he disagreed with May’s characterization of the NDP’s previous commitment to the English TV debate. 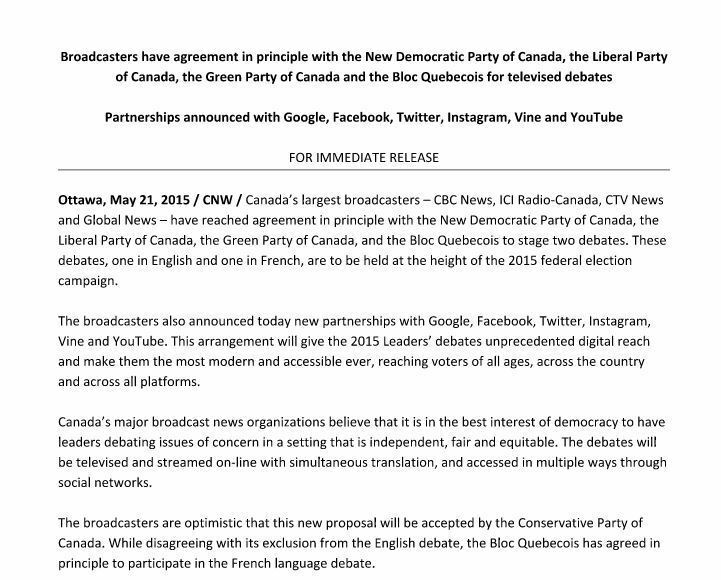 In a May 21 press release, the broadcast consortium announced it had reached an “agreement in principle” with the NDP, Liberals, Greens and Bloc to stage two debates. “These debates, one in English and one in French, are to be held at the height of the 2014 federal election campaign,” the press release signed by consortium spokesperson Liliane Lê said. May also told HuffPost she was upset with Mulcair for not defending her right — as a national party leader with two seats in the Commons and a full slate of candidates across the country — to participate in the TVA, Munk and Globe and Mail debates. The NDP said two weeks ago that it would attend only debates to which Harper and other party leaders had been invited and had agreed to appear in. The Liberals in July said they believed all leaders of parties represented in Parliament should be invited to participate in the debates. “These private debates are being organized by non-criteria and arbitrary rules that seem to have only one thing in common, keeping out the Green Party,” May said. She told HuffPost that this is further proof the NDP and the Tories don’t want her in the debates. “We do remember, in 2008, the NDP and Conservative parties both told the broadcasters privately that if the Green party was included they would refuse to show up,” May said. It was only when that became public that first the NDP caved, and then the Conservatives, that she was allowed to participate, she said. May also expressed surprise that Mulcair, who often professes support for the CBC, was turning his back on a debate organized by the public broadcaster. A source close to the debate negotiations told HuffPost, however, that the CBC is in talks to broadcast the Munk debate. Mulcair’s announcement confirms he is pulling out of not only the English TV debate but also the women’s debate called “Up For Debate” and debates he had previously agreed to with the Federation of Canadian Municipalities, the Canadian Association of Retired Persons, and the Aboriginal People’s Television Network. Debates are not about party leaders, May said, they are about voters. And the televised leaders’ debates are the main way Canadians have access to those leaders, to test and compare where the parties stand on the issues. In a press release Tuesday, the media consortium that organizes the French and English television debates said negotiations with the parties for the English debate were continuing. Teneycke, however, said in a press release that the Conservatives had accepted their “fifth and final” leaders’ debate. “These five debates will offer Canadians an unprecedented opportunity to hear from the party leaders,” he said, including last week’s Maclean’s debate. Despite blasting Mulcair, May said she remains hopeful the NDP leader will change his mind under public pressure.